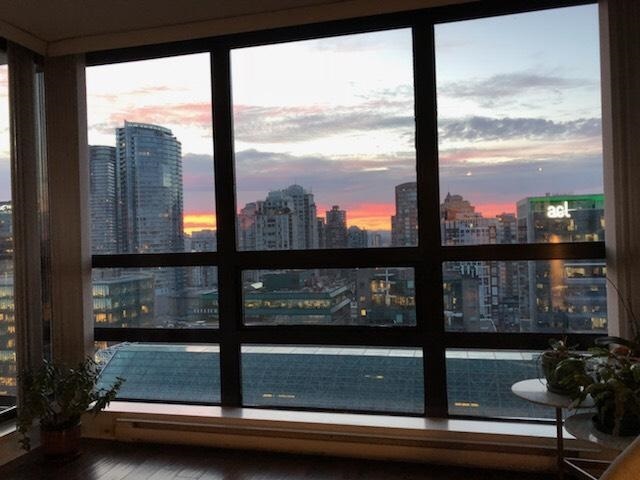 Gorgeous 2 bed 2 bath penthouse condo in the heart of downtown! Floor-to-ceiling city views from your living room! Centrally located, amazing restaurants, Robson St. shopping, 7-minute walk to City Centre & Burrard skytrain, and so many amenities. Enjoy beautiful sunrises while you sip your coffee! Updates: eng. hardwood floors, custom closet organizers, new Bosch dishwasher. Granite countertops, 2 balconies, 2 walk-in closets, and in-suite washer/dryer.No wasted space very functional layout! In-suite storage which can be converted to an office or a music room. Electric Avenue bldg has a large equipped gym, 3 rooftop gardens, private movie theater, party function space, conference room, and a 24-hour concierge for free. Yes, you too can live the dream city life in this urban oasis!